"I Ain't Heard of That"
Already Platinum is the debut album by American rapper Slim Thug. The album was released on July 12, 2005 on Pharrell and Chad Hugo's Star Trak label. The original release date was slated for February 2005, but heavy bootlegging and numerous delays held the album back, forcing a vast majority of its original track listing to be replaced. The original track listing included the original version of the track "I Ain't Heard of That," which featured Jay-Z. In an interview with XXL, the rapper explained the album title does not suggest he will go platinum, but that his lifestyle (before he got a record deal) was already similar to that of rappers who had reached the platinum status. In an interview on The Tyra Banks Show, mentor Pharrell revealed that he was a millionaire before the two met, and he especially liked that about him. He continued to say that he was "already platinum," the album name was just in confirmation of this. The album debuted at number 2 on the Billboard 200 with 130,000 copies sold in the first week released. Since then the album has sold over 500,000 copies. Already Platinum garnered a positive reception from music critics who praised Slim's vocal delivery and the Southern production. Andy Kellman of AllMusic praised Slim's delivery for being more charismatic than Lil' Flip and Mike Jones, and the production work from both Mr. Lee and The Neptunes, concluding that "Already Platinum is one of 2005's best rap albums." Evan McGarvey of Stylus Magazine praised the Neptunes' production for evolving with Slim's Southern drawl and delivery, concluding that "After years of singles that people called "infectious" and "club-ready," they take Slim Thug and his dashing uniqueness and carve diamonds. This album isn’t a musical highlight reel, it’s watching artists shuck off personal curses and step into their own skins." Steve Jones of USA Today said that big names like T.I. and Jazze Pha didn't turn the attention away from the main artist, saying that "Slim [Thug]'s confident, laid-back deliveries keep him from being overshadowed." Chris Ryan of Spin commended Slim for lending his voice to the Neptunes' atmospheric production, saying they "contribute some of their most adventurous work yet." Tom Breihan of Pitchfork Media was critical of most of the tracks by the Neptunes, saying that they "lost the gleaming, clattering swagger they once had, relying instead on bloodless synth lines and itchy, nattering drums" and that Slim's performance in them suffered. But said that the tracks by Mr. Lee ("Diamonds" and "3 Kings") were the highlights, concluding that, "On tracks like this, Slim sounds prehistoric, like he's always existed, like this voice has been echoing over canyons and through caves since before time began." "3 Kings", samples "Secretary" by Betty Wright. "Diamonds", samples "Top Notch Hoes" by Pimp C.
"The Interview", samples "The Newness is Gone" by Eddie Kendricks. "Miss Mary", samples "A Moment With You" by George Michael. Credits for Already Platinum adapted from AllMusic. ↑ Harris, Chris (July 20, 2005). "R. Kelly Fights Off Slim Thug And Bow Wow To Hold #1". MTV. Viacom. Retrieved October 13, 2010. ↑ Juon, Steve (October 12, 2010). "Slim Thug Set to Release "Tha Thug Show" on 11/30!". RapReviews. Retrieved October 13, 2010. ↑ craveonline (2008-08-07). "Slim Thug and Boss Hogg Outlawz to release new album". CraveOnline. Retrieved 2012-01-14. ↑ "Slim Thug Serve & Collect". Hip Hop Galaxy. 2007-02-27. Retrieved 2012-01-14. 1 2 Kellman, Andy. "Already Platinum - Boss Hogg Outlawz/Slim Thug". AllMusic. Retrieved July 10, 2011. ↑ "CG: Slim Thug". Robert Christgau. Retrieved July 10, 2011. ↑ Endelman, Michael (July 8, 2005). "Already Platinum". Entertainment Weekly. Time Inc. Retrieved July 10, 2011. ↑ Ruhi, Adrian (July 2005). "Slim Thug - Already Platinum". Okayplayer. Archived from the original on October 12, 2007. Retrieved October 4, 2016. 1 2 Breihan, Tom (July 12, 2005). "Slim Thug: Already Platinum". Pitchfork Media. Retrieved July 10, 2011. ↑ Hoard, Christian (July 28, 2005). "Slim Thug: Already Platinum". Rolling Stone. Wenner Media. Archived from the original on October 16, 2007. Retrieved July 10, 2011. 1 2 Ryan, Chris (July 12, 2005). 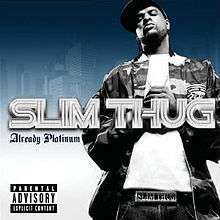 "Slim Thug, 'Already Platinum' (Star Trak/Geffen)". Spin. SpinMedia. Retrieved July 10, 2011. 1 2 McGarvey, Evan (July 15, 2005). "Slim Thug - Already Platinum - Review". Stylus Magazine. Archived from the original on September 14, 2007. Retrieved July 10, 2011. 1 2 Jones, Steve (July 11, 2005). "Bow Wow inspires; Nelson misfires". USA Today. Gannett Company. Retrieved July 10, 2011. ↑ "Vibe - Google Livres". Books.google.com. Retrieved 2015-07-12. ↑ "Slim Thug feat. T.I. and Bun B's 3 Kings sample of Betty Wright's Secretary". WhoSampled. Retrieved July 16, 2015. ↑ "Slim Thug's Diamonds sample of Pimp C's Top Notch Hoes". WhoSampled. Retrieved July 16, 2015. ↑ "Slim Thug's The Interview sample of Eddie Kendricks's The Newness is Gone". WhoSampled. Retrieved July 16, 2015. ↑ "Slim Thug's Miss Mary sample of George Michael's A Moment With You". WhoSampled. Retrieved July 16, 2015. ↑ "Already Platinum - Boss Hogg Outlawz, Slim Thug | Credits". AllMusic. All Media Network. Retrieved July 15, 2015. ↑ "Slim Thug – Chart history" Billboard 200 for Slim Thug. Retrieved December 20, 2014. ↑ "Slim Thug – Chart history" Billboard Top R&B/Hip-Hop Albums for Slim Thug. Retrieved December 20, 2014. ↑ "2005 Year-End Charts: Billboard 200 Albums". Billboard. Prometheus Global Media. Retrieved July 15, 2015. ↑ "2005 Year-End Charts: R&B/Hip-Hop Albums". Billboard. Prometheus Global Media. Retrieved July 15, 2015. "Wamp Wamp (What It Do)"